I had a friend tell me she loved the One Pot Creamy Macaroni and Cheese we posted not too long ago. Who wouldn’t love a delicious dinner that doesn’t dirty up your entire kitchen while preparing it? 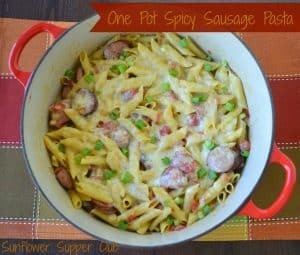 Here is another quick weeknight dinner that will allow you to feed your hungry clan in a flash. My kids love smoked sausage– they call them fancy hot dogs! In a large Dutch Oven or heavy pot heat the olive oil over medium high heat. Add the smoked sausage and the onion and cook until browned, about 5 minutes. Add the garlic and continue cooking for another minute or so until fragrant. Add the chicken broth, Rotel, whipping cream, pasta and Creole seasoning. Bring to a boil and cover the pot. Reduce the heat and simmer for about 12 minutes or until pasta is al dente. Remove from heat and stir in the Parmesan cheese and ½ of the Monterey Jack cheese. Top with the remaining cup of cheese and place under the broiler in the oven until the cheese is melted and beginning to brown. Sprinkle with sliced green onions. The original recipe called for the dish to be prepared in an oven proof skillet, but was not enough for my family of 6. If you have a smaller family the recipe is easily halved. The sauce will thicken a little as it stands. In our opinion we find this is best eaten right after cooking. It isn't great left over. If you would like more protein, add a couple of chicken breasts. I trim and pound boneless skinless breasts to uniform thickness. Cook the chicken first in a tablespoon of olive oil until cooked through. Remove to a plate and set aside. 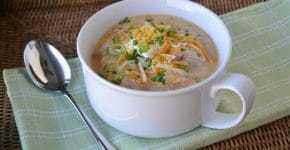 Continue with the recipe and add the diced chicken back to the pot at the end of the recipe when you add the cheeses. You know we love spicy. If you're not sure you might want to start with only ½ teaspoon of the Creole seasoning. The original recipe just called for salt and pepper if you prefer. I think my family would love this dish!